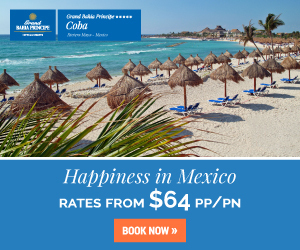 Azul Beach Resort Riviera Cancun all inclusive vacations meet the needs of anyone looking for a coastal getaway that blends relaxation with play. 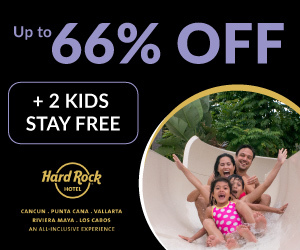 The family-friendly resort is located in Riviera Maya, Mexico (about 15-20 minutes from Cancun International Airport) and has gone above and beyond to create a guest experience that can’t be had just anywhere. The signature Gourmet Inclusive experience at Azul Beach Resort Riviera Cancun opens you to a world of luxury and leisure at no extra cost. You’ll be welcomed with a glass of sparkling wine while the kids can enjoy a refreshing tropical smoothie. 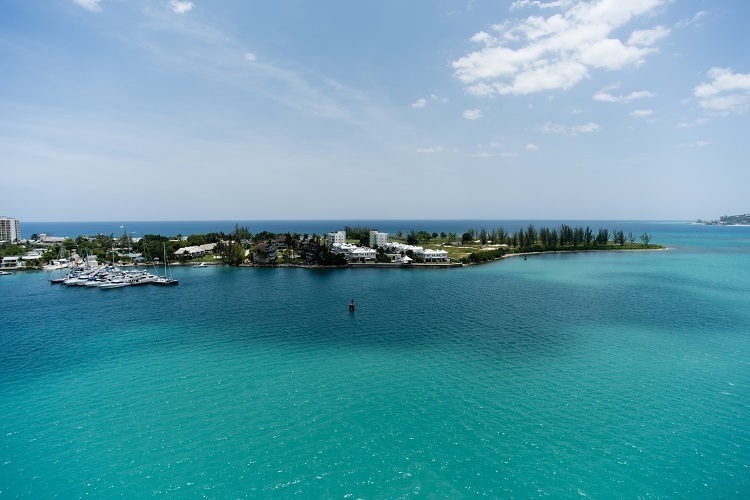 Indulge in gourmet meals and bites, premium alcoholic and non-alcoholic beverages, and all-ages activities day and night. 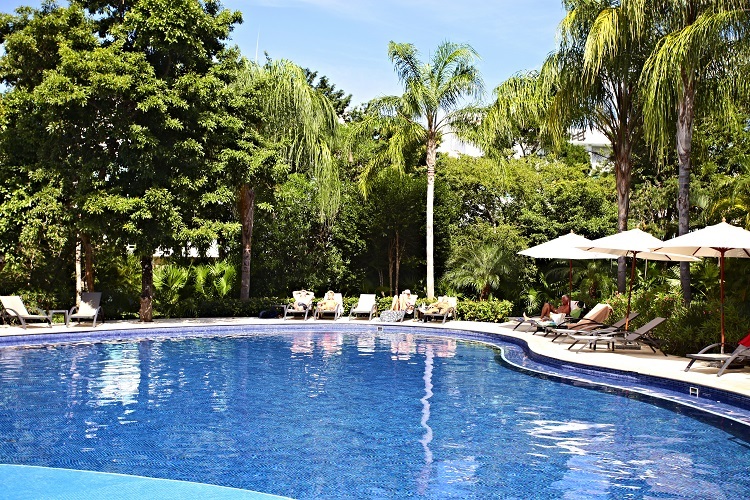 Complimentary Wi-Fi makes it easy to stay connected, if you choose, and the friendly staff provides you with unparalleled service. Parents will also appreciate special family amenities such as strollers, cribs, and pack n’ plays to keep their youngsters comfortable. The all-Jacuzzi suites at Azul Beach Resort Riviera Cancun beautifully infuse modern elegance with authentic Caribbean flair. Options are available to satisfy the specific needs of your traveling party. 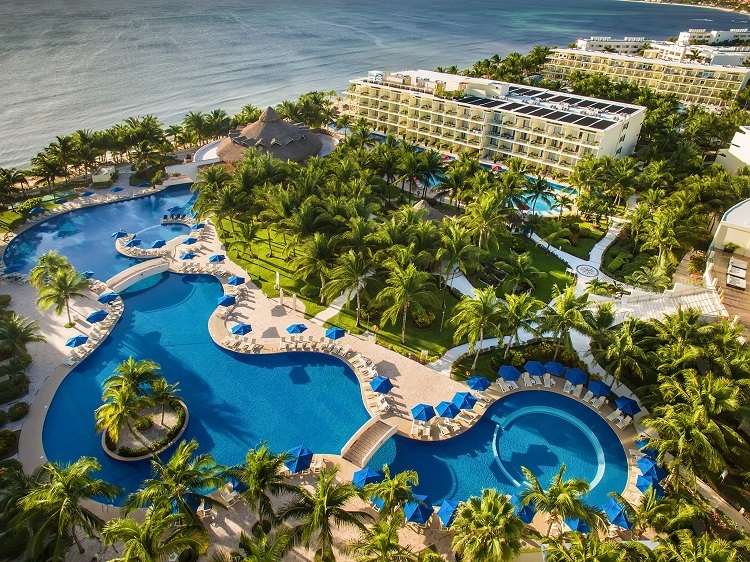 Whether you’re looking for a multi-bedroom suite, family-friendly set-up, a romantic honeymoon haven, or a serene swim-up retreat, you’ll find your ideal landing spot at this stunning Mexico resort. 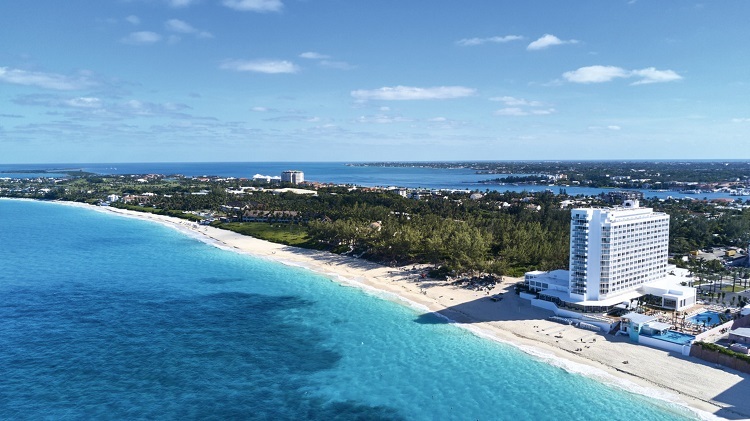 A personal concierge, 24-hour room service, serene views, and more meet every conceivable wish and desire. 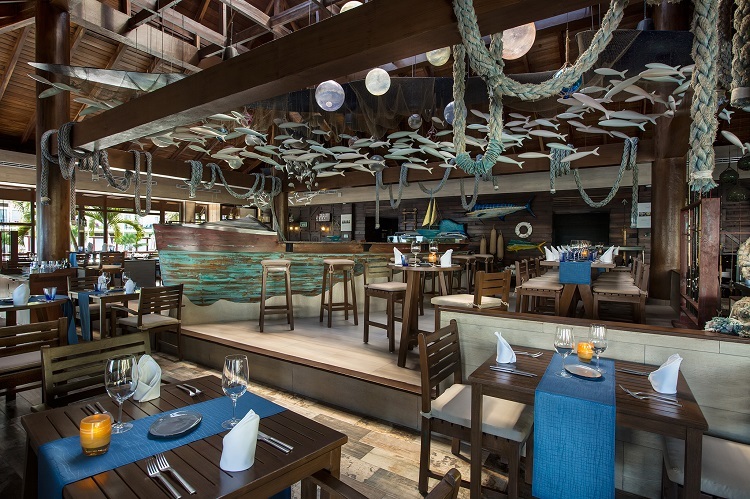 The award-winning cuisine at Azul Beach Resort Riviera Cancun stands out with its savory flavors and fresh ingredients. Dive into plates of international cuisines like Italian, Mexican, Caribbean, and Spanish. Quick-serve lunch spots are casual, but still serve mouthwatering bites throughout the day. Even the presentation is something to remember! In addition to these exceptional eateries, the resort offers a selection of bars and lounges fit for every mood. Sip a cocktail on the beach or in between dips in the pool. Settle into an evening at Zavaz Lounge after your meal or enjoy a rhythmic night out at Mojito Lounge. For beer and tequila, you’ll want to stop by Zocalo Cantina for beautiful Caribbean views while you drink to paradise! 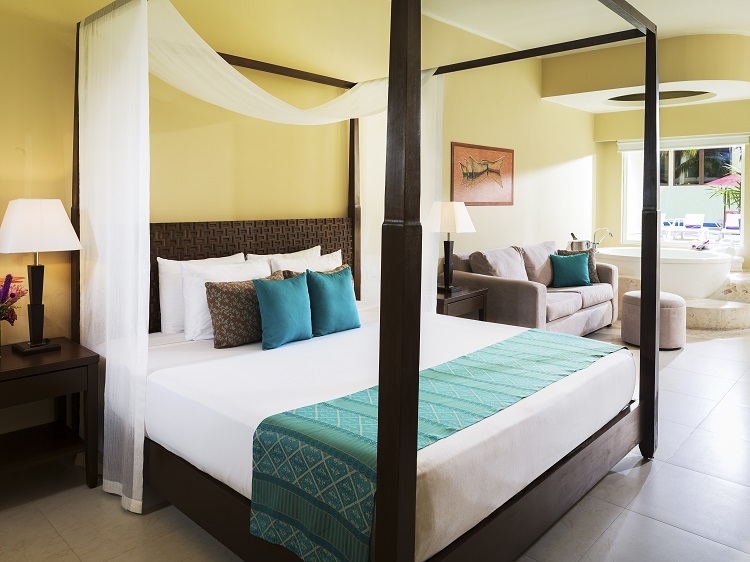 Azul Beach Resort Riviera Cancun makes sure every guest finds excitement in their stay. 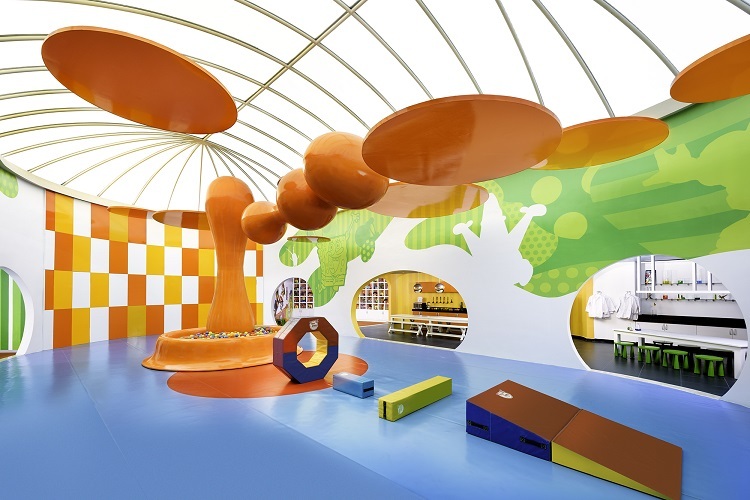 Activities and entertainment are offered for different age groups. Little ones will delight in the Azulitos Playhouse by Nickelodeon and the My Gym Center while teens can hang at Extreme Breeze Teens. The spa even offers a kids menu for ages 5-17 to allow head-to-toe pampering no matter what you’re age! Day and night, you’ll find plenty to experience throughout your stay. Relaxing yoga sessions on the beach and lazy days by the pool are perfect for the laid-back traveler. Other activities like dance lessons, Zumba, and soccer on the beach will get your heart pumping. An adults-only pool featuring Waves Bar welcomes guests 18 years and older to kick back without any interruptions. Be sure to stop by the concierge desk and ask about offsite excursions such as archaeological tours, snorkeling, and a visit to downtown Playa del Carmen to explore your local surroundings! A destination wedding deserves the utmost attention to detail. Azul’s Signature Wedding Designers™ use their expertise to gently lead couples through the planning process. Whatever your individual style, whether classically elegant, retro mod, black tie affair, or resort casual, the wedding pros handle every detail. On your special day, a Personal Wedding Attendant will ensure that you and your loved one have everything you need while a Wedding Guest Concierge provides exceptional care to every member of your party. 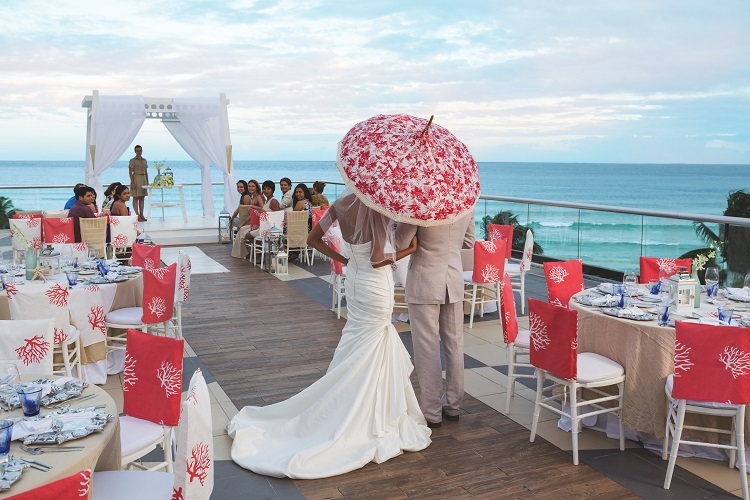 Personal details will shine through in the décor as you celebrate your love story in paradise. The exchanging of vows against the romantic beauty of the Mexico Caribbean will surely wow everyone in attendance and create lasting memories! In addition to weddings, couples are invited to celebrate their honeymoon or anniversary at Azul Beach Resort Riviera Cancun. Romantic offerings such as bottle of champagne upon arrival, discount on spa services, and more make your experience that much more special. 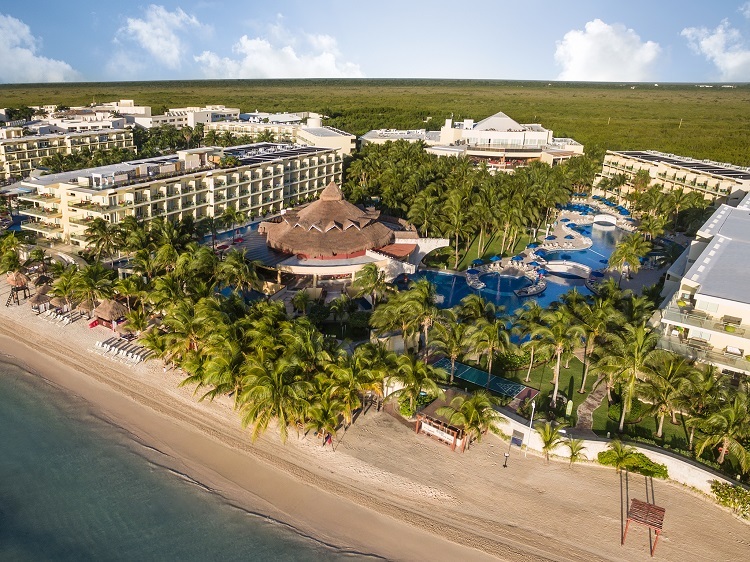 Whether you’re in search of a romantic getaway, a family-friendly retreat, or the wedding venue of your dreams, the exceptional amenities at Azul Beach Resort Riviera Cancun will deliver! All Inclusive Outlet will help get you there. 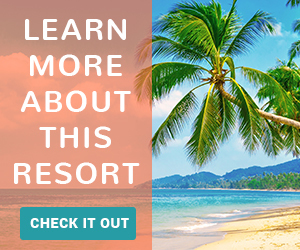 Search through the best discounted vacation packages on our website and start planning your way to a carefree Mexico getaway!